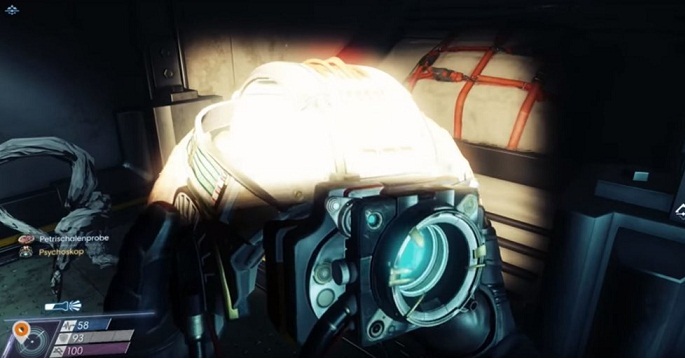 In Prey, you can upgrade the functions of your helmet by using the psychoscope chipset. This allows you to find out hidden mimics faster or create more damage to enemies. Unfortunately, you don’t automatically find the chipsets in the course of the game. However, the Prey's Open-World character allows you to find the locations of the chipsets at any time. Unfortunately, most psychoscope chipsets are randomly generated. At least their function and abilities are different in each game, but their locations are fixed and always in the same places. One exception is story-relevant chipsets. You'll encounter them through the main quests and they will always have the same effects on your helmet. Go to the Security Center to search for a chamber, where you can see a large hole in the ground. There you have to go down, but before you take a fight against several Mimics. If they are defeated, you must follow the course until you find the body of Janos Jozsef. There you get your psychoscope and the first chipset, with which you can recognize hidden Mimics better. For this chipset you have to enter the Debriefing room over the window in Morgan's room. Go through the opening and turn right. If you look at the video in Morgan's office, you can find the appropriate code for a safe. This is in the conference room and you can get this chipset even before you call the actual psychoscope your own. This article is still under construction and we will update it soon for you. If you have found more chipsets, you can share your experience with us in the comment area.